I used a flourish stamp wheel by Stamping Up and white embossing powder on the base card you can just about see it on the right of the image under the tied bow this really pops and gives the card a wonderful detail. 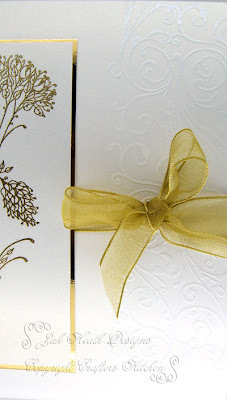 The main stamp by Impression Obsession was heat embossed with glod detail powder then mounted on top of gold mirri card then added to the card after tying a sheer gold ribbon around the middle of the card. Click on the image below for a more details view of the embossed basae card. Another beautiful card, Jak. The stamp is so detailed and the embossing is brilliant. 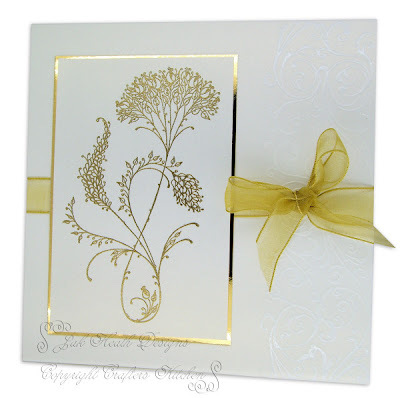 This is stunning, love the white embossed background and the gorgeous gold in the foreground. Lovely stamps and beautiful card. Absolutely gorgeous Jak. I love it. Beautiful card and a gorgeous stamp. A truly lovely elegant card Jak! What a stunning card...I bet it looks terrific in real life. Love that main image. Simply stunning card, very elegant. Very, very elegant card! I wouldn't have thought of the white on white embossing... I love the whole look and feel of the card.